I posted a Beef Wellington recipe a few years ago, (http://cookwithcindy.blogspot.com/search?q=beef+wellington) but in that recipe took a few shortcuts. This is the "real-deal" and I think one that Gordon Ramsey would approve of. 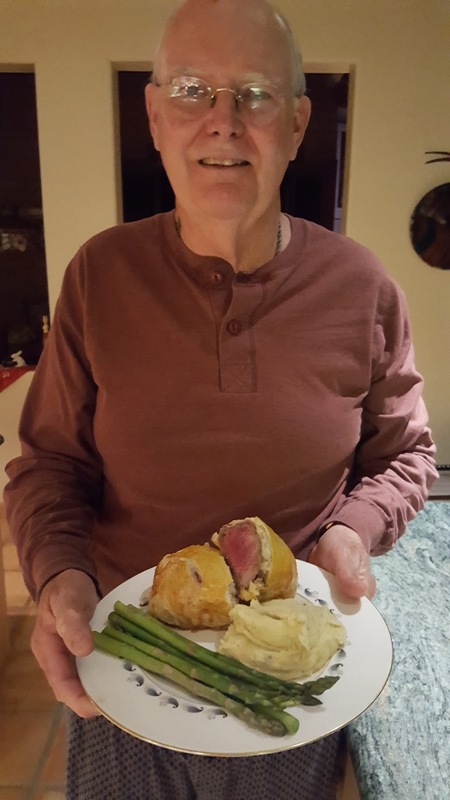 You may think judging by the last few posts that all I cook is beef. Not true, but I try to post the more interesting recipes and lately those seem to involve beef. 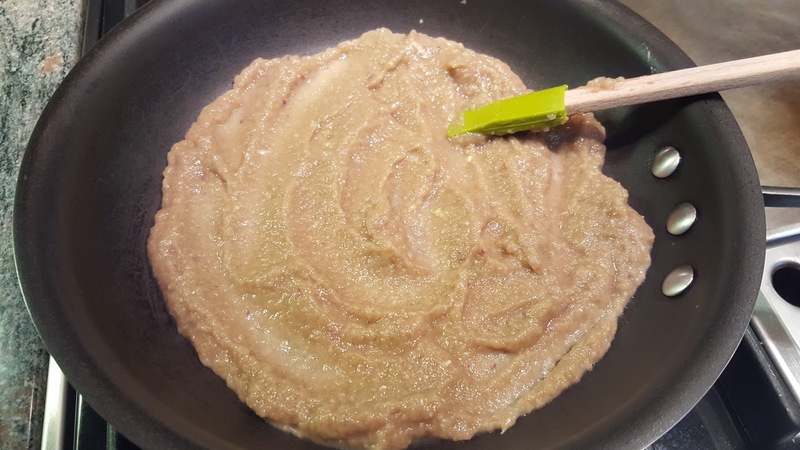 This recipe does involve quite a few steps, but is not difficult and completely worth it! 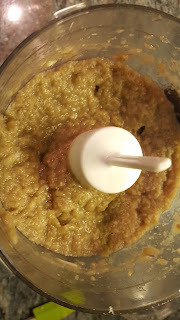 Olive Oil for searing-about 2 Tbsp. *The Maille brand originated in Marseilles, France in 1723. 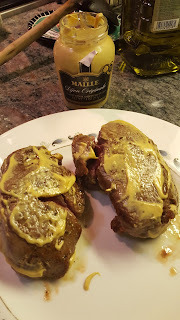 It was sold to the multi-national consumer goods company, Unilever in 2000, but I still love the mustard. Wish I could've tried it before it was sold and now mass produced. Season fillets liberally with salt and pepper. Heat olive oil in a heavy-bottomed skillet until it is nearly smoking. Sear fillets on all sides until just browned. 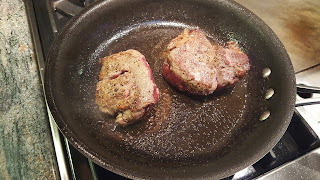 Remove the fillet from the pan. Let cool and then brush all sides with the mustard. 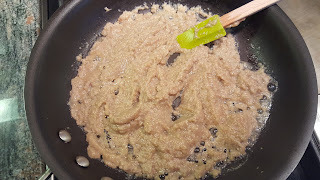 TO PREPARE THE DUXELLES: Chop the mushrooms, add minced garlic and shallots and put them in a blender. I used my mini-max, which is a great chopper. Puree until the mixture becomes a paste. Add a dash of salt. Heat a frying pan on medium high and add the mushroom mixture. Stir the mixture allowing the moisture to be released from the mushrooms. This is what it looks like when it first goes in the pan. And this is how the consistency changes once moisture begins to release. When the moisture has been released from the mushrooms remove from the pan and set aside to cool. Lay out a large piece of plastic wrap. 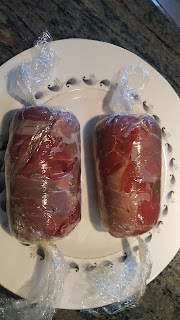 Place the prosciutto on the plastic wrap so the pieces overlap. Spread the mushroom duxelles on the prosciutto. 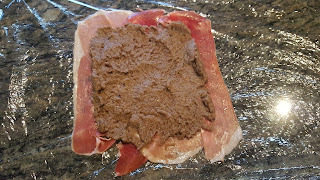 Place the beef in the middle, roll the prosciutto around the beef using the plastic wrap to create a tight barrel. Start by folding the 2 ends around the beef and then roll the longer pieces up and around. The plastic allows you to tighten your roll. Even though this has been a few steps up to this point, now you can let this beef chill in the fridge for at least 20 minutes or for up to a few hours so this nearly qualifies as a "do-ahead" meal preparation. When you're ready to bake, preheat oven to 400 degrees. 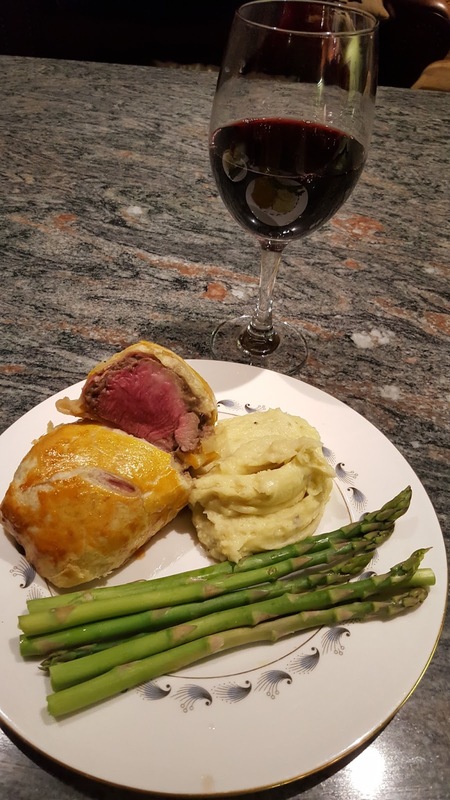 On a lightly floured surface roll out puff pastry to a size that will fit around each beef fillet. I erred on the side of way too much pastry as I didn't want to be short. Better to cut it to fit than not have enough pastry. Generously brush the pastry with the beaten egg yolks. 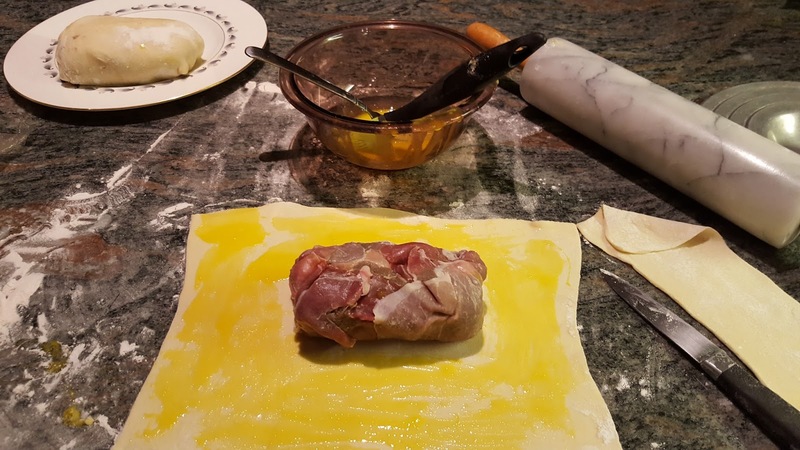 Unwrap the beef fillet and place in the middle of the puff pastry. Fold the pastry around the fillet trying to minimize overlapping pastry as that will not cook through. The pastry is quite forgiving and you can almost stretch it to make a completely sealed roll without much overlap. Cut away any excess pastry and avoid making pastry any more than 2 layers thick. 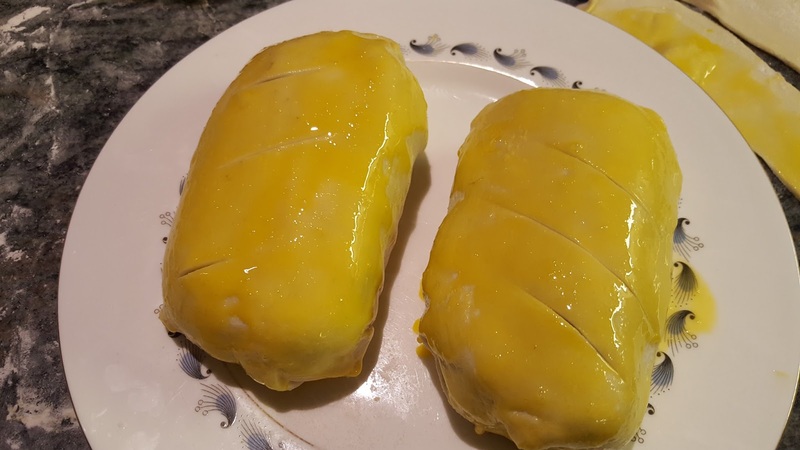 Place the pastry wrapped fillet on a baking sheet and cover with more egg yolk. Gently score the top of each fillet being careful not to go all the way through the pastry. Sprinkle the tops with course sea salt. Now we're finally ready to bake. Place in the preheated oven for 25 to 30 minutes. 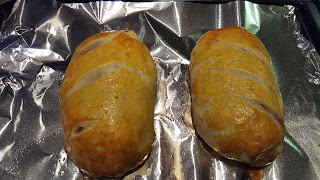 Pastry should be golden brown and if using a meat thermometer it should read 125-130. 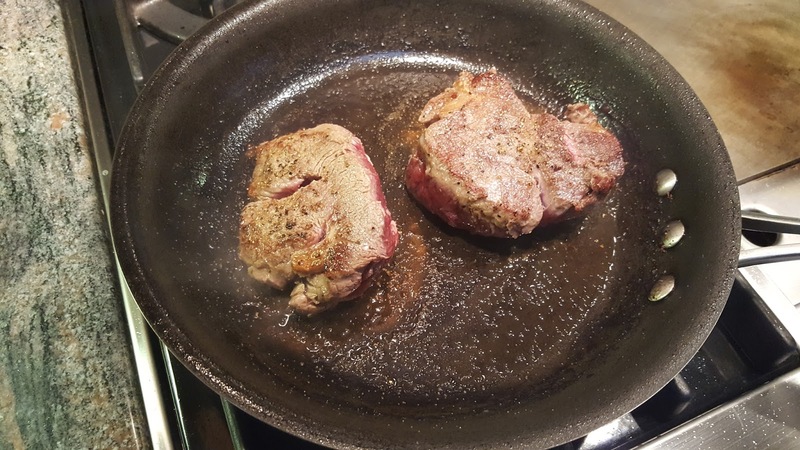 I took mine out at 125 as both my husband and I like our beef on the rare side. Plus it does continue cooking even after removing from the oven. Let rest for 10 minutes before slicing. I prefer to serve in 2 large pieces, but you can also cut into 1inch thick slices. All for today. This is Easter weekend and I want to wish each of you a happy, blessed and beautiful holiday. No cooking for me this year. I will be the happy guest of my good friends Francine and Jim Manspeaker. I am simply bringing the rolls! Easter 2014 Jer and me preparing grilled coconut shrimp.